I am a PhD student at The University of Western Ontario in London. 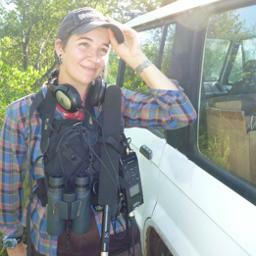 My current research explores spatial and temporal variation in immune genes, avian malaria parasites, microbial communities, and the role of chemical signals in songbird communication and mate choice. More specifically, I am testing whether volatile (odour-producing) compounds in preen oil are used by Song Sparrows (Melospiza melodia) to gather information on the major histocompatibility complex (MHC) genotype and/or infection status with avian malaria parasites of potential mates. I am also investigating whether preen gland microbial communities are correlated with MHC genotype and preen oil chemical composition. To assess whether geographically distinct Song Sparrow populations differ in their MHC-genotypes, parasite communities, preen oil chemistry, and microbial communities, I am sampling wild birds at three locations across southern Ontario, and using gas chromatography and molecular genetic tools to characterize preen oil chemical composition, MHC, parasite diversity, and microbial diversity at each population. My MSc research focused on acoustic and visual communication in a cooperatively breeding cuckoo, the Smooth-billed Ani (Crotophaga ani). During three field seasons in southwestern Puerto Rico, I completed research projects on 1) vocal repertoire, 2) referential alarm signaling, and 3) signals of aggressive intent in anis. My BSc research explored brood parasitism, brood reduction, and nest predation in Red-winged Blackbirds (Agelaius phoeniceus).